It was at the age of 17 that Drew Brees accepted Jesus Christ as his Lord and Savior. A decision made one Sunday at a church in Texas. On that day, Drew decided he would live for a greater purpose, he was giving the wheel to God, knowing that he wasn't always going to understand why things happen, but knowing that God is in control and he could trust that the Lord will make his path straight. Some recruiters came back after Brees went 16-0 his senior season and led his high school football team to a state championship. Ultimately, Brees went to Purdue where he had a great career. Things were looking up after the knee injury and wondering if he could ever make football a part of his life again. Selected 32nd overall in the 2001 NFL draft, Brees had made it to play with the San Diego Chargers. It wasn't long and he earned a starting role as the Chargers QB. All that climbing after his 11th grade injury and Brees had finally made it. That is until a horrible shoulder dislocation came in 2003 that put everything back in question...a bad dislocation in his shoulder joint and a 360-degree tear of his labrum and rotator cuff; not something you see NFL quarterbacks ever return from, or really any athlete that throws a ball. It wasn't long and the Chargers traded Brees, knowing there were many question-marks on whether he could return from such an injury. Perhaps you've heard the Drew Brees story, or maybe this is your first time, but to know the story and to understand how Brees trusted in the Lord through all these times are two very different things. Every doctor that worked on his shoulder was stunned and couldn't understand how Brees could return so soon and have such an amazing career. Not only did Brees become a starting QB again, but he led the NFL in passing yards year-after-year. He also won a Superbowl with the Saints, became an MVP of that same Superbowl, brought home a few NFL offensive player-of-the-year awards, and countless other honors. The injuries that Drew has faced have led him to where he is; a devoted husband, father, teammate, but most importantly; servant to his Savior. Each circumstance that he faced has allowed him to see God work in amazing ways, after Brees gave the Lord the wheel. Because of his high school injury, Brees went to Purdue University which is where he met his future wife. After suffering the horrible injury in San Diego, he found himself in New Orleans, where he became a father of 4 and has been an active and contributing member to many communities in need. 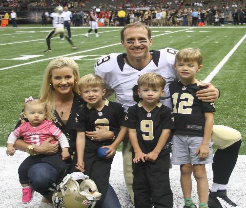 In 2003 The Brees Dream Foundation was set-up and since has contributed and/or committed almost $25,000,000.00 to help improve the quality of life for cancer patients and provide care, education and opportunities for children and families in need. When asked about his journey, Bees has been quoted saying, "Understand, there's always a plan." Whatever your ACL or Shoulder injury might be, know that God is using it because He has bigger and better plans for you than you have for yourself. In the hardest times, push into the Lord and allow Him to guide you. We've all heard 'hindsight is 20/20.' It's not hard to see what God is up to when it's all said and done, but put your faith in knowing that He is leading and guiding you today for His perfect plan. When faced with a potentially 'career-ending injury' give up your own will or understanding and allow God to do his magic!